MILFORD, Indiana U.S.A. - Roll-forming equipment to aid in the fabrication of steel products was recently added to Brock Grain Systems’ manufacturing facilities. This improved method of forming parts has helped Brock to more economically produce heavier gauge steel stiffeners for use on grain silo sidewalls. The manufacturing ability also allowed Brock’s product engineers to add more height to BROCK® Grain Storage Silos. The taller silos present the opportunity for Brock’s customers to select greater storage capacities in the same silo footprint. With the sidewall stiffener improvements, Brock’s grain silos can be built taller with sidewall heights reaching up to 30 meters (99 feet) at the silo’s roof eave. With the additional height, Brock’s engineers were able to add more storage capacity with the largest tank now able to hold up to 730,400 bushels. In addition, Brock’s revolutionary TRI-CORR® Silo Aeration Floor System works effortlessly with the new taller grain silo models. Introduced to the market in 2003, the award-winning TRI-CORR Floor System is the strongest aeration floor Brock offers and can be used in Brock’s tallest grain storage tanks without extra flooring crown support. 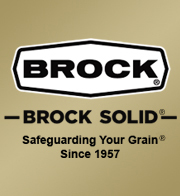 The ability to more easily manufacture heavier gauge steel sidewall stiffeners combined with Brock’s TRI-CORR Flooring System means BROCK® Commercial Grain Storage Systems offer grain producers and grain facilities more high capacity storage options along with the potential for lower per bushel storage costs.